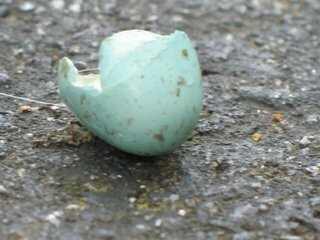 Came across this tiny robin's egg yesterday afternoon while getting the mail. I wonder if it's too late to get into color week... Thursday::blue (formerly hosted at littlebirds.typepad.com) . I keep seeing other people's pictures and am inspired to join in! so sweet! I used to collect these in a shoebox under my bed when I was little.